Marcel Hirscher won the overall title for the fifth successive year. By late December 2015, the season had seen year-ending injuries to two top skiers. Austrian Matthias Mayer suffered severe spinal damage in the downhill competition at Gröden in Val Gardena, Italy, and German Josef Ferstl  damaged his knee during training in Santa Caterina, Italy on the Downhill course. Despite his broken back, Mayer is optimistic about returning for a 2017 World Cup try following his much debated crash. During the crash that injured Mayer, another World Cup first took place when the 'body airbag' he was wearing inflated. The new protective gear, now worn by many skiers, has never been deployed during a World Cup competition prior to this. The system is designed to minimize severe thoracic injuries, like the one Mayer suffered, by deploying quickly during tumbles and mishap. Emergency responders could see that the "airbag" had engaged as designed before they even knew about the broken spine. It has not been determined if the "protective gear" prevented worse injury, promoted the injury that was received, or had no effect in the matter. An odd incident marred the early season as a small, remotely-piloted camera helicopter, operated by broadcast media, nearly foiled Marcel Hirscher's podium effort by crashing during his run and narrowly missing him. A day after the incident, the International Ski Federation adopted the policy of banning remotely-piloted vehicles from flying over their events as a matter of safety and concern for the welfare of their athletes, staff and viewers. Senior Race Director Markus Waldner stated his displeasure with the occurrence and insisted that the ban will remain in effect as long as he is on the job. The newly introduced Parallel Giant Slalom  event at Alta Badia, Italy, was a relatively short Giant Slalom course that pitted the men against one another in a modified bracket-reduction format from thirty-two 1st run skiers, to sixteen 2nd bracket skiers that eventually dwindled to just four final round racers. The Snow Queen Trophy slalom planned for Sljême, Croatia was cancelled and diverted to Santa Caterina, Italy for lack of snow, while the early season slalom in Levi, Finland suffered similar conditions, but could not find a home to reschedule to in the very busy year. By mid-season, the World Cup overall leader, as well as Downhill and Super-G discipline leader, Aksel Lund Svindal was out following a crash during the Downhill at Kitzbühel. He suffered a season-ending injury to his right knee and needed immediate surgery. Georg Streitberger of Austria also suffered a season-ending knee injury in the same race, which was ended after only thirty skiers left the starting gate. Poor visibility, and the number of serious crashes that were occurring, prompted race officials to halt the event at the minimum skiers required to have it qualify as a complete event. Lara Gut. First Swiss female to capture the Overall since 1995. The first part of the season produced many injuries to several top skiers. Sara Hector severely injured her knee  in Giant Slalom, during the competition in Åre, Sweden, and two event champions from the previous season, Lindsey Vonn and Mikaela Shiffrin missed several events due to recent incidents. Vonn missed the October and November events to continue rehabilitating from last year's season-ending injury, and from a recent dog bite from one of her pets. Shiffrin dropped-out in mid-December to recuperate from an injury suffered during practice at Åre. Shiffrin's recovery was not immediate and she missed the heart of the race season, however, she returned to the circuit in mid-February and promptly dominated the competition. The lack of snowy weather eliminated the women's race weekend at St. Anton's, Austria, two weeks before the planned event. Officials recognized that they did not have enough snow on the ground, and that they did not have the ability to generate enough man-made snow for safe racing. The events were quickly relocated to Zauchensee, Austria, for the same dates. A few days later, officials cancelled the Snow Queen Trophy slalom planned at Sljême, Croatia. The stop was the only one planned for Croatia this season, and was one of the few joint stops on tour where male and female teammates crossed paths during the year. The slalom event was quickly rescheduled to Santa Caterina, Italy on consecutive days. The middle of the season saw a significant reshuffle of many of the events throughout The Alps. Six events were cancelled in January for unseasonably warm weather and insufficient snow. The events were promptly repositioned to snowier venues further down the schedule. In contrast, mid-February saw a few events abandoned due to soft and excessive snow, over two meters in one instance... a significant safety concern for the high speed disciplines. At the end of the February, during the Super-G in Soldeu, Vonn, having just returned from injury seven weeks earlier, crashed again while leading near the end of her run. She raced the next day in the Combined event, earned a few points, then ended her season on Monday after a complete medical evaluation in Barcelona revealed several hairline fractures in her knee. At the time of her departure, she had already won the Downhill discipline for the season and was leading the Overall, Super-G and Combined disciplines. Notable skiers that did not participate this year include: Anna Fenninger, the defending World Cup champion who was forced to skip the season due to a serious knee injury. Tina Maze, last season's runner-up decided to take a short hiatus during the 2016 season before permanently deciding to continue, or end, her World Cup career. Champion skier Julia Mancuso decided to opt for hip surgery in November, 2015, instead of rushing back after non-surgical therapy failed to give her the full recovery she had hoped for. Her stated goal is to get back to winning form in time to qualify for the 2018 Winter Olympics in South Korea. ^ "World Alpine Ski Championships 2017". St. Moritz Hosting Committee. ^ "Mayer Requires Surgery To Repair Broken Back". International Ski Federation. 19 December 2015. Archived from the original on 23 December 2015. Retrieved 25 December 2015. ^ "Ferstl Tears Knee Ligament". International Ski Federation. 28 December 2015. ^ "Mayer's Planned Return". FOX Sports. 30 December 2015. ^ "Mayer Body Bag Inflation". New York Daily News. 23 December 2016. ^ "TV Media Crashes Remotely-Piloted Camera Helicopter". International Ski Federation. 23 December 2015. Archived from the original on 24 December 2015. Retrieved 25 December 2015. ^ "FIS Bans RPV Helo Camera". New York Daily News. 23 December 2015. ^ "Parallel Giant Slalom Explained". International Ski Federation. 20 December 2015. Archived from the original on 23 December 2015. Retrieved 25 December 2015. ^ "Svindal Downhill Crash Ends Season". Salt Lake Tribune. 23 January 2016. ^ a b "Sölden Ski Park". Ski Austria. ^ "Men's Giant Slalom – Sölden, AUT". International Ski Federation. 25 October 2015. ^ "Ligety Prevails On Tight Course". International Ski Federation. 25 October 2015. Archived from the original on 21 January 2016. Retrieved 8 March 2016. ^ a b "Levi Ski Resort". Levi Lapland. ^ "Levi, Finland Events Cancelled". International Ski Federation. 5 November 2015. Archived from the original on 2015-11-08. Retrieved 2015-12-05. 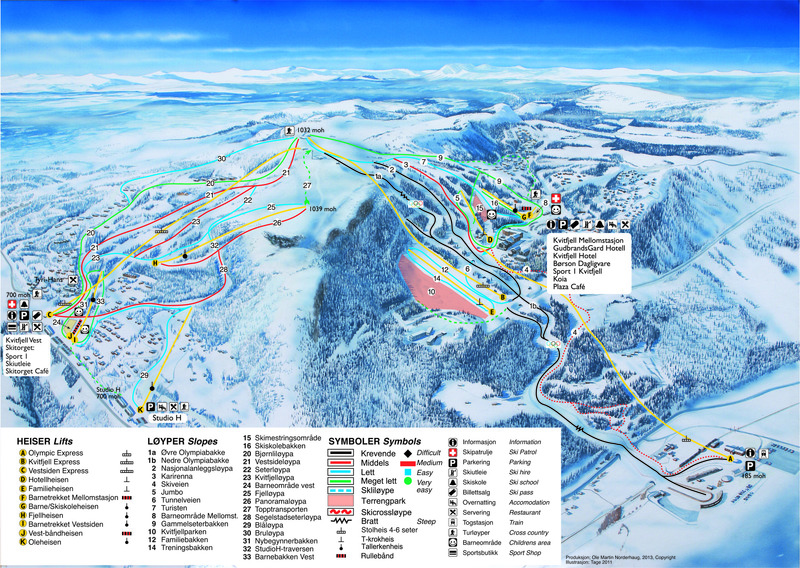 ^ a b "Lake Louise Course Map" (PDF). LL Alpine Ski World. Archived from the original (PDF) on 2016-03-04. Retrieved 2016-01-06. ^ "Men's Downhill – Lake Louise, Canada". International Ski Federation. 28 November 2015. ^ "Svindal's Narrow Margin". Ski-Racing Magazine (online). 28 November 2015. ^ "Men's Super G – Lake Louise, Canada". International Ski Federation. 29 November 2015. ^ "A Svindal Sveep". Ski-Racing Magazine (online). 29 November 2015. 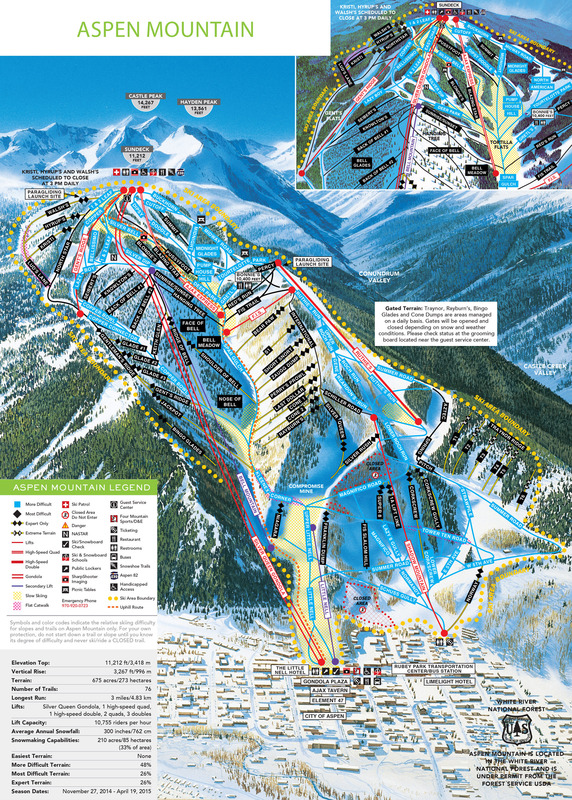 ^ "Beaver Creek Hill Map". Vail Resorts Management Co.
^ "Men's Downhill – Beaver Creek, United States". International Ski Federation. 4 December 2015. ^ "Triple Wins For Svindal". International Ski Federation. 4 December 2015. Archived from the original on 6 December 2015. Retrieved 5 December 2015. ^ "Men's Super G – Beaver Creek, United States". International Ski Federation. 5 December 2015. ^ "Hirscher claims first". International Ski Federation. 5 December 2015. Archived from the original on 8 December 2015. Retrieved 6 December 2015. ^ "Men's Giant Slalom – Beaver Creek, United States". International Ski Federation. 6 December 2015. ^ "Hirscher nails Beaver". International Ski Federation. 6 December 2015. Archived from the original on 9 December 2015. Retrieved 7 December 2015. ^ a b "Val d-Isère Slalom at Bellvarde". World Cup Val-d-Isère. Archived from the original on 2016-03-04. Retrieved 2016-01-06. ^ "Men's Giant Slalom – Val d'Isere, France". International Ski Federation. 12 December 2015. ^ "Hirscher Tops First Run". International Ski Federation. 12 December 2015. Archived from the original on 15 December 2015. Retrieved 13 December 2015. ^ "Men's Slalom – Val d'Isere, France". International Ski Federation. 13 December 2015. ^ "Kristofferson Bounce Back Win". Ski-Racing Magazine (online). 13 December 2015. 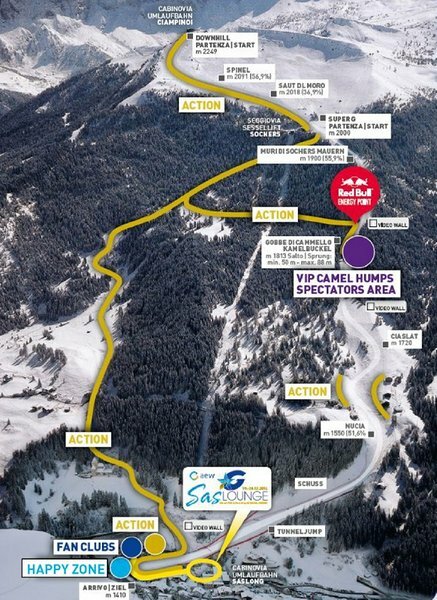 ^ "Val Gardena Course Map". Saslong Organization. Archived from the original on 2016-01-25. Retrieved 2016-01-04. ^ "Men's Super G – Val Gardena/Gröden, Italy". International Ski Federation. 18 December 2015. ^ "Viking Raiders Take Italy". Ski-Racing Magazine (online). 18 December 2015. ^ "Men's Downhill – Val Gardena/Gröden, Italy". International Ski Federation. 19 December 2015. ^ "Svindal Still Perfect". Ski-Racing Magazine (online). 19 December 2015. ^ "Alta Badia Hill Layout". SudTirol. Archived from the original on 2016-01-26. Retrieved 2016-01-04. ^ "Men's Giant Slalom – Alta Badia, Italy". International Ski Federation. 20 December 2015. ^ "Hirscher's 3rd Early Season Victory". Ski-Racing Magazine (online). 20 December 2015. ^ "Men's Parallel Giant Slalom – Alta Badia, Italy". International Ski Federation. 21 December 2015. ^ "Jansrud 1". Eurosport Magazine (online). 22 December 2015. 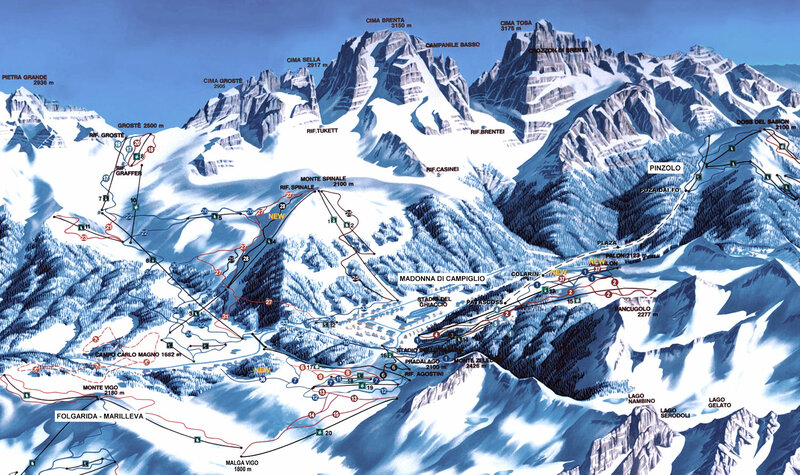 ^ "M-d'Campiglio Hill Map". Ski Two Italia (online). ^ "Men's Slalom – Madonna di Campiglio, Italy". International Ski Federation. 22 December 2015. ^ "Kristoffersen's One man Show". International Ski Federation. 22 December 2016. Archived from the original on 24 December 2015. Retrieved 24 December 2015. ^ a b c d "Cancelled races in Zagreb, Croatia rescheduled in Santa Caterina, Italy". International Ski Federation. 28 December 2016. Archived from the original on 2015-12-30. Retrieved 2015-12-29. ^ a b "Planned Course layout". Bormio. January 2016. ^ "Men's Downhill - Santa Caterina, Italy". International Ski Federation. 29 December 2015. ^ "Théaux Grabs Downhill Win". International Ski Federation. 29 December 2015. Archived from the original on 1 January 2016. Retrieved 5 January 2016. ^ "Men's Slalom - Santa Caterina, Italy". International Ski Federation. 6 January 2016. ^ "Hirscher Win Moves Career To New Level". International Ski Federation. 6 January 2016. Archived from the original on 7 January 2016. Retrieved 6 January 2016. ^ a b "City event – Munchen, Germany". International Ski Federation. 2 October 2015. Archived from the original on 2015-11-23. Retrieved 2015-11-22. 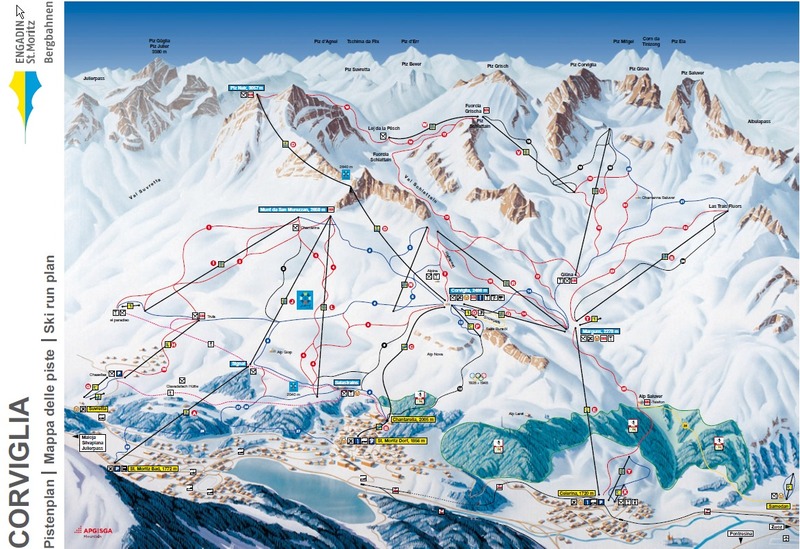 ^ "Adelboden Hill Map". On The Snow (online). Archived from the original on 2016-01-24. Retrieved 2016-01-04. ^ "Adelboden giant slalom cancelled". International Ski Federation. 9 January 2016. Archived from the original on 2016-01-12. Retrieved 2016-01-09. ^ a b "Hinterstoder, Austria Picks-Up Cancelled Adelboden GS". FOX Sports Network. 13 January 2016. ^ "Men's Slalom - Adelboden, Switzerland". International Ski Federation. 10 January 2016. ^ "Kristoffersen King Of AdelSlalom". Archived from the original on 2016-01-12. Retrieved 2016-01-10. . International Ski Federation. 10 January 2016. ^ "Wengen LauberHorn Slalom Profile". LaugerHorn Ski Club, Switzerland. ^ "Wengen LauberHorn Downhill Profile". LaugerHorn Ski Club, Switzerland. ^ "Wengen LauberHorn Hill Layout" (PDF). GeoInformation Kanton, Bern. ^ "Men's Alpine Combined - Wengen, Switzerland". International Ski Federation. 15 January 2016. ^ "Triple Podium Toppings". Ski-Racing Magazine (online). 15 January 2016. ^ "Men's Downhill - Wengen, Switzerland". International Ski Federation. 16 January 2016. ^ "Svindal Wins Lauberhorn". International Ski Federation. 16 January 2016. Archived from the original on 20 January 2016. Retrieved 16 January 2016. ^ "Men's Slalom - Wengen, Switzerland". International Ski Federation. 17 January 2016. ^ "Kristoffersen Anchors Hat Trick". Ski-Racing Magazine (online). 17 January 2016. ^ "HahnenKamm Course Layout". Kitzbühel Ski Club. ^ "Men's Super G - Kitzbühel, Austria". International Ski Federation. 22 January 2016. ^ "Axel Lund sWINs all Spectaculario". International Ski Federation. 22 January 2016. Archived from the original on 24 January 2016. Retrieved 22 January 2016. ^ "Men's Combined - Kitzbühel, Austria". International Ski Federation. 22 January 2016. ^ "Team Pinturault Sweeps The Podium". International Ski Federation. 22 January 2016. Archived from the original on 24 January 2016. Retrieved 23 January 2016. ^ "Men's Downhill - Kitzbühel, Austria". International Ski Federation. 23 January 2016. ^ "Fill Claims Victory". Ski-Racing Magazine (online). 23 January 2016. ^ "Men's Slalom - Kitzbühel, Austria". International Ski Federation. 24 January 2016. ^ "Kristoffersen Wins In Comeback Effort". Ski-Racing Magazine (online). 24 January 2016. ^ "Men's Slalom - Schladming, Austria". International Ski Federation. 26 January 2016. ^ "King Kristof". Ski-Racing Magazine (online). 26 January 2016. ^ a b "Garmisch-P Course Map" (PDF). Garmisch World Cup Ski. ^ "Men's Downhill - Garmisch Partenkirchen, Germany". International Ski Federation. 30 January 2016. ^ "Kilde's Garmisch Surprise". Ski-Racing Magazine (online). 30 January 2016. 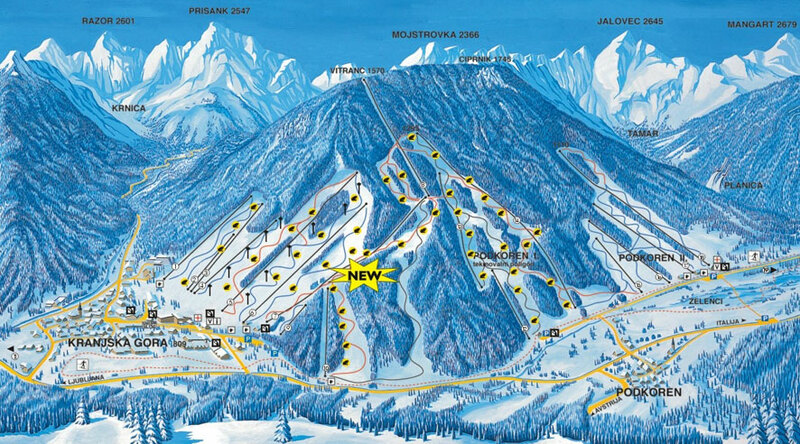 ^ "Garmisch GS Rescheduled To Krans-Gora". Snow Alps.com. 12 February 2016. ^ "Jeongseon Trail Map". Ski Resort Info (online). ^ "Green Light For Olympic Test Event". International Ski Federation. 20 January 2016. Archived from the original on 2016-01-23. Retrieved 2016-01-21. ^ "Korea Passes Olympic Test". International Ski Federation. 10 February 2016. Archived from the original on 18 February 2016. Retrieved 11 February 2016. ^ "Men's Downhill - Jeongseon, Korea". International Ski Federation. 6 February 2016. ^ "Jansrud In Korean First". International Ski Federation. 6 February 2016. Archived from the original on 2016-02-09. Retrieved 2016-02-06. ^ "Men's Super G - Jeongseon, Korea". International Ski Federation. 7 February 2016. ^ "Janka Dominates Tricky Course". Ski-Racing Magazine (online). 7 February 2016. 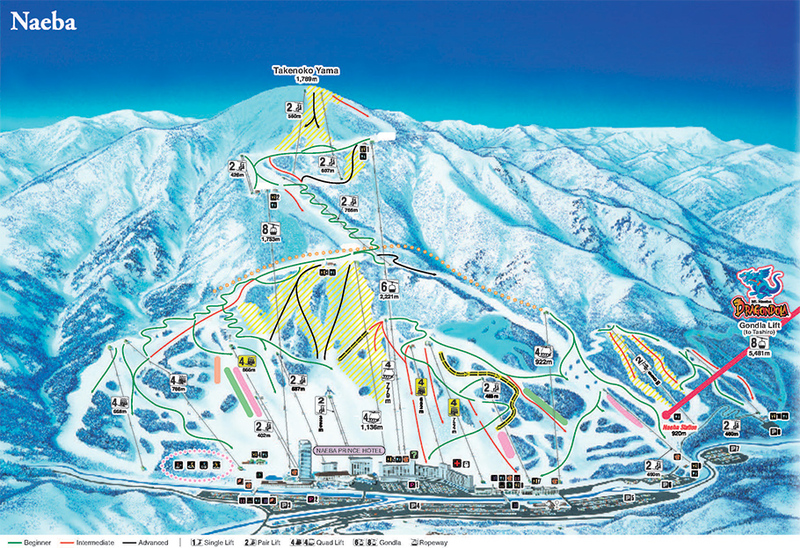 ^ "Naeba Hill Map". Japan-Ski-Australia. Archived from the original on 2016-02-27. Retrieved 2016-01-04. ^ "Men's Giant Slalom - Yuzawa Naeba, Japan". International Ski Federation. 13 February 2016. ^ "Pinturault Grabs Giant Slalom". International Ski Federation. 13 February 2016. Archived from the original on 16 February 2016. Retrieved 14 February 2016. ^ "Men's Slalom - Yuzawa Naeba, Japan". International Ski Federation. 14 February 2016. ^ "Neureuther Wins Tough Race". International Ski Federation. 14 February 2016. Archived from the original on 16 February 2016. Retrieved 14 February 2016. ^ "Chamonix Hill Map". Compagnie du Mont Blanc. ^ "Men's Super Combined - Chamonix, France". International Ski Federation. 19 February 2016. ^ "Pinturault Takes All". International Ski Federation. 19 February 2016. Archived from the original on 21 February 2016. Retrieved 19 February 2016. ^ "Men's Downhill - Chamonix, France". International Ski Federation. 20 February 2016. ^ "Paris". Ski-Racing Magazine (online). 20 February 2016. ^ a b "Hammarbybacken Hill Map". On the Snow (online). ^ "Men's City Event - Stockholm, Swewden". International Ski Federation. 23 February 2016. ^ "Hirscher Prevails". Euro Sport Magazine (online). 23 February 2016. ^ "Hinterstoder Hill Map". Energie Arena, AG. Archived from the original on 2016-03-04. Retrieved 2016-01-04. ^ "Men's Giant Slalom - Hinterstoder, Austria". International Ski Federation. 26 February 2016. ^ "Men's Super G - Hinterstoder, Austria". International Ski Federation. 27 February 2016. ^ "Kilde Beats Hinterstoder Again". International Ski Federation. 27 February 2016. Archived from the original on 1 March 2016. Retrieved 27 February 2016. ^ "Men's Giant Slalom - Hinterstoder, Austria". International Ski Federation. 28 February 2016. ^ "Pinturault Claims Third Straight Win". Ski-Racing Magazine (online). 28 February 2016. ^ "Podkoren One Course". Snow Forecast (online). ^ "Men's Giant Slalom - Kranjska Gora, Slovenia". International Ski Federation. 4 March 2016. ^ "Pinturault Claims Fourth Straight Win". Euro Sport Magazine (online). 4 March 2016. ^ "Men's Giant Slalom - Kranjska Gora, Slovenia". International Ski Federation. 5 March 2016. ^ "Hirscher Secures Globe". International Ski Federation. 5 March 2016. Archived from the original on 7 March 2016. Retrieved 5 March 2016. ^ "Men's Slalom - Kranjska Gora, Slovenia". International Ski Federation. 6 March 2016. ^ "Hirscher Cruises To Win". Ski-Racing Magazine (online). 6 March 2016. 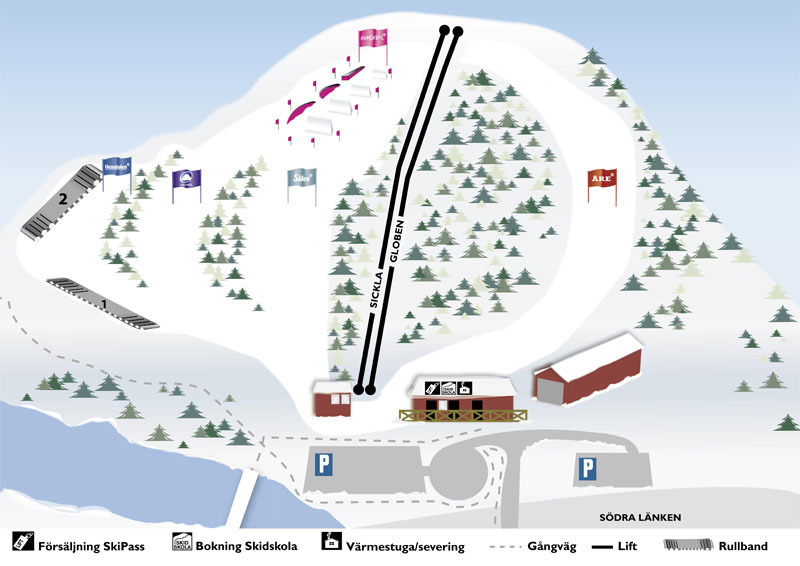 ^ "Kvitfjell Hill Map". On-The-Snow (online). ^ "Men's Downhill - Kvitfjell, Norway". International Ski Federation. 12 March 2016. ^ "Paris Defeats Norway". International Ski Federation. 12 March 2016. Archived from the original on 13 March 2016. Retrieved 13 March 2016. ^ "Men's Super G - Kvitfjell, Norway". International Ski Federation. 13 March 2016. ^ "Jansrud's Hometown Victory". Ski-Racing Magazine (online). 13 March 2016. ^ a b c "Course Layout St. Moritz". Ski World Cup. March 2016. ^ a b c "Hill Layout at St. Moritz". March 2016. Archived from the original on 2015-06-12. Retrieved 2016-03-18. ^ "Men's Downhill - Saint Moritz, Switzerland". International Ski Federation. 16 March 2016. ^ "Feuz Leads The Way". Ski-Racing Magazine (online). 16 March 2016. ^ "Men's Super G - Saint Moritz, Switzerland". International Ski Federation. 17 March 2016. ^ "Feuz Doubles Down". Ski-Racing Magazine (online). 17 March 2016. ^ "Men's Giant Slalom - Saint Moritz, Switzerland". International Ski Federation. 19 March 2016. ^ "Fanara Leads French Sweep". International Ski Federation. 19 March 2016. Archived from the original on 24 March 2016. Retrieved 22 March 2016. ^ "Men's Slalom - Saint Moritz, Switzerland". International Ski Federation. 20 March 2016. ^ "Mhyrer Dazzles". Ski-Racing Magazine (online). 20 March 2016. ^ Leaderboard - Men's Overall. International Ski Federation. 2016 season. ^ Leaderboard - Men's Downhill. International Ski Federation. 2016 season. ^ Leaderboard - Men's Super G. International Ski Federation. 2016 season. ^ Leaderboard - Men's Giant Slalom. International Ski Federation. 2016 season. ^ Leaderboard - Men's Slalom. International Ski Federation. 2016 season. ^ Leaderboard - Men's Combined. International Ski Federation. 2016 season. ^ ""Hector requires surgery to repair severe knee damage during first run"". Archived from the original on 2015-12-15. Retrieved 2015-12-25. ^ "Vonn Back After Injuries". CNN. 11 December 2015. ^ "Shiffrin Out With Knee Injury". KUSA-TV. 17 December 2016. ^ "Shiffrin's Planned Return". Ski-Racing Magazine (online). 8 February 2016. ^ a b "Mother Nature Forces Cancellation Of Saint Anton Races". International Ski Federation. 27 December 2015. Archived from the original on 29 December 2015. Retrieved 27 December 2015. ^ a b "St. Anton Events Relocated To Zauchensee". International Ski Federation. 27 December 2015. Archived from the original on 2015-12-30. Retrieved 2015-12-28. ^ "Vonn Injury". Ski-Racing Magazine (online). 2 March 2016. ^ "Fenniger Injury". NY Times. October 2015. ^ "Maze Temporarily Suspends Career". RTV, Slovenian Public Broadcasting. 7 May 2015. ^ "Mancuso Out All Season". International Ski Federation. 11 November 2015. Archived from the original on 20 December 2015. Retrieved 2 January 2016. ^ "Ladies' Giant Slalom – Sölden, AUT". International Ski Federation. 24 October 2015. ^ "Brignone Nearly Flawless". Ski-Racing Magazine (online). 24 October 2015. ^ "Levi's Slalom Rescheduled To Aspen". International Ski Federation. 13 November 2015. Archived from the original on 2015-12-09. Retrieved 2015-11-13. ^ "Aspen Hill Map". Aspen Mtn Skiing. Archived from the original on 2015-09-07. Retrieved 2016-01-04. ^ "Ladies' Giant Slalom – Aspen, United States". International Ski Federation. 27 November 2015. ^ "Gut Prevails In GS". Ski-Racing Magazine (online). 27 November 2015. ^ "Ladies' Slalom – Aspen, United States". International Ski Federation. 28 November 2015. ^ "Shiffrin Reverses Curse". Ski-Racing Magazine (online). 28 November 2015. ^ "Ladies' Slalom – Aspen, United States". International Ski Federation. 29 November 2015. ^ "League Shiffrin". International Ski Federation. 29 November 2015. Archived from the original on 3 December 2015. Retrieved 5 December 2015. ^ "Ladies' Downhill – Lake Louise, Canada". International Ski Federation. 4 December 2015. ^ "Vonn-tacular". International Ski Federation. 4 December 2015. Archived from the original on 6 December 2015. Retrieved 5 December 2015. ^ "Ladies' Downhill – Lake Louise, Canada". International Ski Federation. 5 December 2015. ^ "Vonn Double". International Ski Federation. 5 December 2015. Archived from the original on 7 December 2015. Retrieved 6 December 2015. ^ "Ladies' Super G – Lake Louise, Canada". International Ski Federation. 6 December 2015. ^ "Vonn Triple". International Ski Federation. 6 December 2015. Archived from the original on 9 December 2015. Retrieved 7 December 2015. ^ "Åre Women Home Page". Åre World Cup. Archived from the original on 2016-02-13. Retrieved 2016-01-03. ^ "Ladies' Giant Slalom – Åre, Sweden". International Ski Federation. 12 December 2015. ^ "Vonn Quadruple". International Ski Federation. 12 December 2015. Archived from the original on 15 December 2015. Retrieved 13 December 2015. ^ "Ladies' Slalom – Åre, Sweden". International Ski Federation. 13 December 2015. ^ "Vlhová's Maiden Cup". International Ski Federation. 13 December 2015. Archived from the original on 15 December 2015. Retrieved 13 December 2015. ^ "Ladies' Combined – Val d'Isère, France". International Ski Federation. 18 December 2015. ^ "Gut Sneaks Won In". Ski-Racing Magazine (online). 18 December 2015. ^ "Ladies' Downhill – Val d'Isère, France". International Ski Federation. 19 December 2015. ^ "Gut @ Val d'Isere". International Ski Federation. Archived from the original on 2015-12-20. Retrieved 2015-12-19. ^ "Emile-Allais Piste". Sport Courcheval. Archived from the original on 2016-01-27. Retrieved 2016-01-03. ^ "Ladies' Giant Slalom – Courchevel, France". International Ski Federation. 20 December 2015. ^ "Brem @ Courcheval". International Ski Federation. Archived from the original on 2015-12-23. Retrieved 2015-12-20. ^ "Ladies' Giant Slalom – Lienz, Austria". International Ski Federation. 28 December 2015. ^ "Gut Sparkles in Lienz". International Ski Federation. Archived from the original on 2015-12-30. Retrieved 2015-12-28. ^ "Ladies' Slalom – Lienz, Austria". International Ski Federation. 29 December 2015. ^ "Hansdotter Hangs On For Slalom Win". International Ski Federation. 29 December 2015. Archived from the original on 1 January 2016. Retrieved 5 January 2016. ^ "Ladies' Slalom – Santa Caterina, Austria". International Ski Federation. 5 January 2016. ^ "Løseth Claims First World Cup Victory". International Ski Federation. 5 January 2016. Archived from the original on 7 January 2016. Retrieved 5 January 2016. ^ "Saint Anton Ski Park". Ski Austria. December 2015. ^ "Ladies' Downhill - Zauchensee, Austria". International Ski Federation. 9 January 2016. ^ "Vonn's Record Setting Story". Ski-Racing Magazine (online). 9 January 2016. ^ "Ladies' Super G - Zauchensee, Austria". International Ski Federation. 10 January 2016. ^ "Vonn Seize Double". International Ski Federation. 10 January 2016. Archived from the original on 12 January 2016. Retrieved 10 January 2016. ^ "Ofterschwang Home Page (all languages)". WeltCup-Ofterschwang. ^ "Ofterschwang Race Map (all languages)". WeltCup-Ofterschwang. ^ "Flachau Race Course". Ski Flachau World Cup. ^ "Ladies' Slalom - Flachau, Austria". International Ski Federation. 12 January 2016. ^ "Velez-Zuzulová Nearly Flawless In Flachau Night Event". Archived from the original on 2016-01-16. Retrieved 2016-01-13. . International Ski Federation. 12 January 2016. ^ "Ladies' Slalom - Flachau, Austria". International Ski Federation. 15 January 2016. ^ "Zuzu's Dream Week". International Ski Federation. 15 January 2016. Archived from the original on 17 January 2016. Retrieved 16 January 2016. ^ "Ladies' Giant Slalom - Flachau, Austria". International Ski Federation. 17 January 2016. ^ "Rebensburg Claims Seasons First". International Ski Federation. 17 January 2016. Archived from the original on 20 January 2016. Retrieved 17 January 2016. 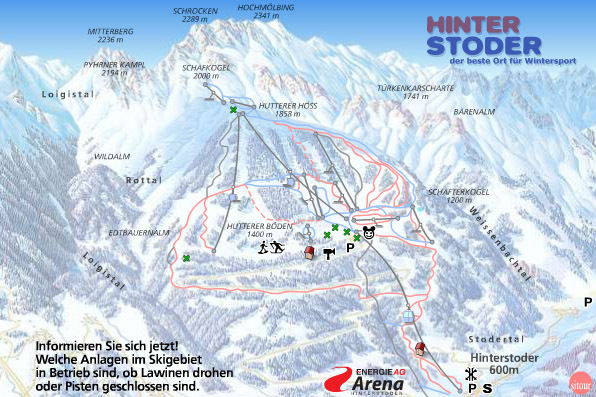 ^ "Cortina Classic Slalom Map" (PDF). Cortina Classic Organization Committee. ^ "Ladies' Downhill - Cortina d'Ampezzo, Italy". International Ski Federation. 23 January 2016. ^ "Vonn Sets Record Number Of DH Wins". International Ski Federation. 23 January 2016. Archived from the original on 25 January 2016. Retrieved 23 January 2016. ^ "Ladies' Super G - Cortina d'Ampezzo, Italy". International Ski Federation. 24 January 2016. ^ "Vonn Doubles Down In Cortina". Ski-Racing Magazine (online). 24 January 2016. ^ "Maribor Hill Map". Sourced by Google Earth, PINA and WB Ski. ^ "Ladies' Giant Slalom - Maribor, Slovenia". International Ski Federation. 30 January 2016. ^ "Embrace Miss Rebensburg Takes". Ski-Racing Magazine (online). 30 January 2016. ^ a b "Cancelled Maribor Slalom Rescheduled To Crans Montana". International Ski Federation. 5 February 2016. Archived from the original on 2016-02-25. Retrieved 2016-02-05. ^ "Ladies' Downhill - Garmisch Partenkirchen, Germany". International Ski Federation. 6 February 2016. ^ "Vonn Dominates Kandahar". International Ski Federation. 6 February 2016. Archived from the original on 8 February 2016. Retrieved 6 February 2016. ^ "Ladies' Super G - Garmisch Partenkirchen, Germany". International Ski Federation. 7 February 2016. ^ "Gut Enough". Ski-Racing Magazine (online). 7 February 2016. ^ "Race Course - Piste Mont Lachaux Profiles". Crans Montana Committee. ^ "Mother Nature Cancels Crans-Montana Downhill". International Ski Federation. 14 February 2016. Archived from the original on 17 February 2016. Retrieved 14 February 2016. ^ "Event Delay & Cancellation". International Ski Federation. 13 February 2016. Archived from the original on 15 February 2016. Retrieved 13 February 2016. ^ "Ladies' Slalom - Crans Montana, Switzerland". International Ski Federation. 31 January 2016. ^ "Shiffrin's Spectacular Return". International Ski Federation. 15 February 2016. Archived from the original on 17 February 2016. Retrieved 15 February 2016. ^ "La Thuile Race Page". Consorzio Operatori Turistici La Thuile. ^ "Ladies' Downhill - La Thuile, Italy". International Ski Federation. 19 February 2016. ^ "Gut Back On Top". International Ski Federation. 19 February 2016. Archived from the original on 21 February 2016. Retrieved 19 February 2016. ^ "Ladies' Downhill - La Thuile, Italy". International Ski Federation. 20 February 2016. ^ "Fanchini Wins At Home". International Ski Federation. 20 February 2016. Archived from the original on 22 February 2016. Retrieved 20 February 2016. ^ "Ladies' Super G - La Thuile, Italy". International Ski Federation. 21 February 2016. ^ "Weirather Season First". International Ski Federation. 21 February 2016. Archived from the original on 24 February 2016. Retrieved 21 February 2016. ^ "Ladies' City Event - Stockholm, Sweden". International Ski Federation. 23 February 2016. ^ "Holdener's Maiden Victory". Euro Sport Magazine (online). 23 February 2016. ^ "Soldeu Area Hill Map" (PDF). Soldeu Resort, Andorra. ^ "Ladies' Super G - Soldeu El Tarter, Andorra". International Ski Federation. 27 February 2016. ^ "Brignone Grabs First Super-G Win". Ski-Racing Magazine (online). 27 February 2016. ^ "Ladies' Alpine Combined - Soldeu El Tarter, Andorra". International Ski Federation. 28 February 2016. ^ "Gagnon's Attack From The Back". Ski-Racing Magazine (online). 28 February 2016. ^ "Jasná Course Map" (PDF). Jasná World Cup. Archived from the original (PDF) on 2016-01-25. Retrieved 2016-01-03. ^ "Jasná Giant Slalom Delayed". International Ski Federation. 5 March 2016. Archived from the original on 7 March 2016. Retrieved 5 March 2016. ^ "Ladies' Slalom - Jasná, Slovakia". International Ski Federation. 6 March 2016. ^ "Shiffrin unBEARably Fast". Ski-Racing Magazine (online). 6 March 2016. ^ "Ladies' Giant Slalom - Jasná, Slovakia". International Ski Federation. 7 March 2016. ^ "Brem Dominates Jasná". Ski-Racing Magazine (online). 7 March 2016. ^ "Lenzerheide Media Center" (PDF). Lenzerheide (online). Archived from the original (PDF) on 2016-03-13. Retrieved 2016-03-13. ^ "Ladies' Super G - Lenzerheide, Switzerland". International Ski Federation. 12 March 2016. ^ "Hütter Claims Maiden Gold". International Ski Federation. 12 March 2016. Archived from the original on 13 March 2016. Retrieved 13 March 2016. ^ "Ladies' Alpine Combined - Lenzerheide, Switzerland". International Ski Federation. 13 March 2016. ^ "Hometown Hero Holdener". Ski-Racing Magazine (online). 13 March 2016. ^ "Ladies' Downhill - St. Moritz, Switzerland". International Ski Federation. 16 March 2016. ^ "Stunning First Timer". Ski-Racing Magazine (online). 16 March 2016. ^ "Ladies' Super G - St. Moritz, Switzerland". International Ski Federation. 17 March 2016. ^ "Sweet Swiss Sunshine". Ski-Racing Magazine (online). 17 March 2016. ^ "Ladies' Slalom - St. Moritz, Switzerland". International Ski Federation. 19 March 2016. ^ "Shiffrin's Gaping Win". Ski-Racing Magazine (online). 19 March 2016. ^ "Ladies' Giant Slalom - St. Moritz, Switzerland". International Ski Federation. 20 March 2016. ^ "Last One A Fast One". Ski-Racing Magazine (online). 20 March 2016. ^ Leaderboard - Women's Overall. International Ski Federation. 2016 season. ^ Leaderboard - Women's Downhill. International Ski Federation. 2016 season. ^ Leaderboard - Women's Super G. International Ski Federation. 2016 season. ^ Leaderboard - Women's Giant Slalom. International Ski Federation. 2016 season. ^ Leaderboard - Women's Slalom. International Ski Federation. 2016 season. ^ Leaderboard - Women's Combined. International Ski Federation. 2016 season. ^ "2016 Team Event Rules" (PDF). International Ski Federation. March 2016. Archived from the original (PDF) on 2015-11-24. Retrieved 2016-01-01. ^ "Nation Grand Prix - St. Moritz, Switzerland". International Ski Federation. 18 March 2016. ^ "Host Nation Takes Grand Prix". Ski-Racing Magazine (online). 18 March 2016. ^ Leaderboard - National Team. International Ski Federation. current season. ^ Leaderboard - Men's Team. International Ski Federation. current season. ^ a b "FIS Official Prize Standings". International Ski Federation. current season. ^ a b "Current CHF Conversion Exchange". XE - The World's Trusted Currency Authority. - "World Cup Home Page at International Ski Federation". - "Ski Coverage at FOX Sports Network"
- "Social Media Hub at International Ski Federation". Archived from the original on 2016-01-11. Retrieved 2016-01-01. - "Female Competitors at International Ski Federation". Archived from the original on 2016-01-28. Retrieved 2016-01-01. - "Male Competitors at International Ski Federation". - "Latest News and Multi-Media at International Ski Federation". Archived from the original on 2016-01-06. Retrieved 2015-11-13. or "RSS Feed". Archived from the original on 2016-01-20. Retrieved 2016-01-02. 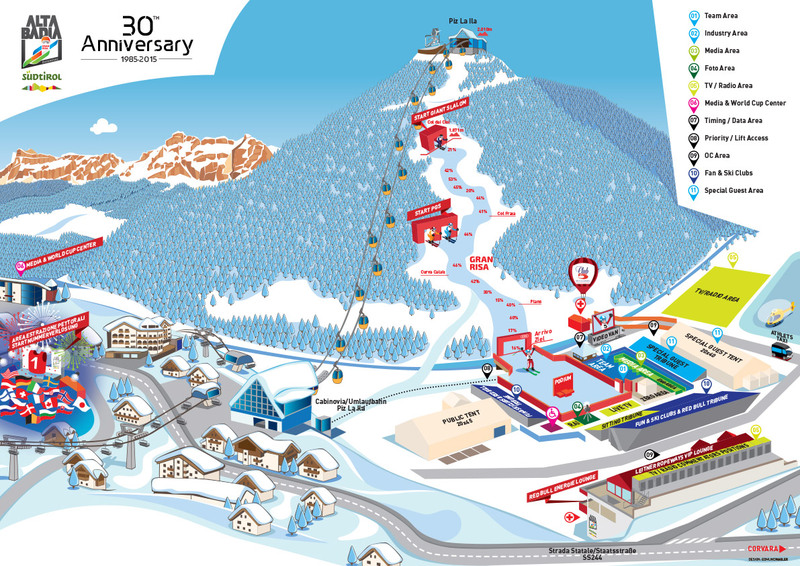 - "Slopes, Venues, Access, and Arena Ticketing at International Ski Federation". Archived from the original on 2016-01-20. Retrieved 2016-01-01. - "Current Reporting about this season at Ski-Racing Magazine (online)". - "Current Reporting about this season at Euro-Sport Magazine (online)". - "Documents, Rules & Guidelines at International Ski Federation". Archived from the original on 2017-02-01. Retrieved 2016-01-01.